Today, joint owners Mirvac Group (”Mirvac”) [ASX: MGR] and AMP Capital held a topping off ceremony to celebrate the completion of the main structural works for their landmark Sydney office building, 200 George Street in Sydney’s CBD. 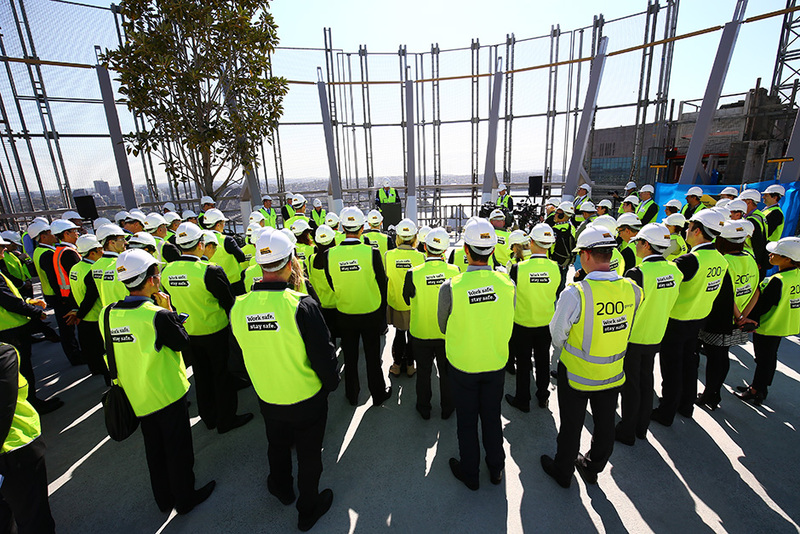 Mirvac’s CEO & Managing Director, Susan Lloyd-Hurwitz, said, “The topping off ceremony marks a significant milestone and is recognition of the collaborative effort by all the parties involved in our 200 George Street project. We are delighted to share this special occasion with the NSW Minister for Planning, Rob Stokes, our joint owner, AMP Capital and anchor tenant, EY. “We are proud to be delivering a building of this calibre that will set a benchmark for the city’s premium grade office towers and become Mirvac’s new headquarters in mid-2016. “The building’s distinctive design, adaptable workspaces, green credentials and open public space will deliver an interactive and cutting-edge workplace for the future. Ms Lloyd-Hurwitz added that 200 George Street demonstrates the significant in-house property development and investment expertise and the benefits of Mirvac’s integrated model in delivering a premium grade asset to Mirvac Property Trust and AMP Capital. Head of Funds Management for AMP Capital, Chris Judd, said, “We are pleased to have reached this significant milestone in the 200 George Street development with our partner Mirvac. We look forward to adding the completed, high-quality asset to the AMP Capital Wholesale Fund’s portfolio and deliver an excellent investment outcome for our clients." Standing at 37 storeys, the tower offers a net lettable area of approximately 39,200 square metres of premium grade office space situated on a landmark Sydney CBD site. Construction of the $600 million tower is on schedule for completion in mid-2016. Architects, Francis-Jones Morehen Thorp, have embraced Mirvac’s and AMP Capital’s vision to create a truly innovative and revolutionary building incorporating world-class design principles. Its dual curvilinear form embraced in natural timber, sandstone and high transparency glass, clearly sets it apart from the cold metallic box towers that dominate city skylines. The landmark building makes provision for multi-level working environments that are designed to connect teams vertically and horizontally to promote collaboration and integration and enable flexible working. These, combined with Mirvac’s new head office workspace with market leading technology, creates a building that is highly responsive to its workforce. 200 George Street is set to be one of Australia’s most environmentally advanced and sustainable buildings with a 6 Star Green Star – Office Design v3 rating achieved, and a 6 Star As Built rating and 5 Star NABERS rating being targeted. It will be Australia’s first fully LED lit building after extensive product investigation, resulting in reduced power consumption costs, more efficient lighting, lower maintenance cycles and a reduction of landfill during the life of the fitting. In total, the building is now 81 per cent pre-leased following EY’s commitment to occupy 25,760 square metres of office space for a 10-year term, commencing January 2017.